Confidence in your results. Flexibility in assay design. To obtain high quality results we have chosen the superior miRNA platform of Quantabio for our biomarker services. This platform offers a cost-effective method to measure multiple RNA molecules from a single RT reaction. The open technology provides flexibility to design your own assay primers and eliminates inefficient stem-loop priming and costly hydrolysis probes. It has been reported as one of the best miRNA profiling platforms and guarantees to deliver reliable results." Learn more about how our miRNA system outperformed the competition in a recent Nature methods paper! We are pleased to share our technology and guidelines for primer design, to generate your own assays specific to your miRNAs. The sequences to our Oligo-dT Adapter Primer and Universal Primer are now available for free using the tech note. Following this protocol will provide you the necessary primers to work along with the qScript microRNA cDNA kit and PerfeCTa SYBR Green Supermix. Download the tech note PDF here. 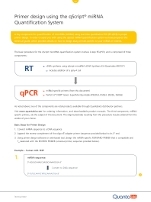 If you are a former/existing customer of our PerfeCTa miRNA Assays, we are happy to provide you the sequence of your assay so that you can continue ordering it through any vendor of your choice. To download the Excel sheet containing the assay sequences, please click HERE. Use the CTRL-F function within excel to search for your assay of interest and find the corresponding sequence.